For years, I thought of Clarins strictly as a higher-end French cosmetics company; then, a friend shared a few gift-with-purchase items with me, and I had the chance to try the brand's "Relax" shower gel and body lotion. I've been interested in Clarins' fragranced products ever since then, so I looked forward to trying Eau des Jardins when it was launched in May. Eau des Jardins is recommended as an aromatherapeutic product, created with "more than 10 essential oils and three bud extracts (beech, blackcurrant and sorbier)"; the plant-bud extracts are also reportedly beneficial to the skin. More specifically, the notes of this "treatment fragrance" are listed as an opening of grapefruit, citrus, bergamot and orange; a heart of mint, laurel leaves, rose and blackcurrant bud absolute; and base notes of cedar wood, patchouli, vetiver, white musk. Eau des Jardins' bottle is visually appealing, with shades of ruby and chartreuse that complement the fragrance well: it's a blend of tart red fruits and crisp green leaves. The fragrance's initial phase reminds me of some summer cocktail that involves citrus fruits, especially limes and orange slices, mixed with a little pomegranate juice for color. The citrus idea fades into just-ripe currants, and despite the mentions of black currant buds in the official descriptions, this note seems more like red currant to me. Then Eau des Jardins reveals a transparent woody core; and I don't get much of a floral note, with the possible exception of a dry rose behind the currants, so the overall composition feels like more like a sunny, leafy orchard than a flower garden. In the dry down, the sheer wood turns lightly musky, prolonging the effect of the currants and the leaves. Over the past week of warm weather, I've been alternating Eau des Jardins with Diptyque L'Ombre dans L'Eau, a berries-and-greenery classic, and Creative Universe Vita, which features plum and black currant in its tea-based composition, and it has held up well against both fragrances. It has above-average staying power: the sillage dies down after an hour or two, but I could still detect the fragrance on my wrist four hours after I'd applied it. It's a versatile fragrance: casual but not juvenile, straightforward but not dull. My only, small quarrel over this product is its placement within the Clarins line. Like the cult-favorite Eau Dynamisante and its fellow "treatment fragrances," Eau des Jardins is classified as a "Well-Being" product on the Clarins website, and it's lumped into the "Sunshine" section with the summer-oriented Eau Ensoleillante (Sunshine Fragrance). It deserves its own sub-category, and I'm hoping it will eventually gain some matching body products too. In the meantime, I'll finish off my sample vial and consider purchasing a full bottle for late-summer into early-autumn wear. Clarins Eau de Jardins is available in a 100 ml size for $48. 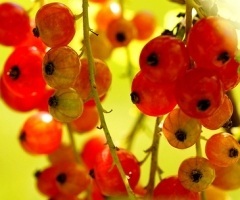 Note: top left image is Red Currant [cropped] by dorena-wm on flickr; some rights reserved. Thanks, Jessica! You have successfully piqued my interest in this line. This sounds pretty and refreshing. Love that photo, too! P.S. I’ve got to try Eau Ensoleillante, too, if only for its name! Hi, Haunani — Their “real” perfume, Par Amour, doesn’t thrill me, but I’m quite fond of the Well-Being fragrances! They’re nicely done. The bottle actually looks like that? They have me sold on that alone! Miss Kitty, Yes, the bottle has a nice ombre’ effect, with the colors shading into one another! mmmm sunny, leafy orchard sounds better than a flower garden to me anyhow! Makes it sound more soothing and meditative. Very tempting! Thanks for the review Jessica , I’ll definitely need to check this out. Hi, Daisy — It’s just fruity enough, in a non-Jolly-Ranchers way, and just leafy enough but not as sharp-green as L’Ombre dans L’Eau (which I love, but some people find a bit *too* sharp). Worth checking out! Thank you Jessica. I adore this line, and pretty much every single product in it! Hi, Sarahbeth! I really like their UV Plus facial sunscreen, and my husband uses the men’s version of it (probably the same stuff in a different bottle…! ), and I keep meaning to try more of their skincare and cosmetics! I’m not all that familiar with Clarins – I’ve tried Par Amours Toujours (very not me), and have a small bottle of Par Amour I picked up at TJ Maxx for $12, but that’s it. I mean, first tried L’Ombre THIS WEEK. Completely left that out. Mals86, I’m a longtime L’Ombre dans L’Eau admirer… welcome to the L’Odl’E fan club! I have a feeling Clarins isn’t as well known for its fragranced products as it is for its skincare, although the Eau Dynamisante seems to have lots of loyal supporters. Datura, I was happily surprised by this one, too. And the price is very reasonable! I’m unfamiliar with the Clarins line but that will change – you had me at “sunny, leafy orchard”. I haven’t tried the other fragrances you compared it to but that’s what is so much fun about perfume . . . one scent always leads to another! Ruth, It’s so, so true… about one fragrance leading to another. I love your avatar, by the way. Thanks for this great review, Jessica, and for bringing a nice, affordable line to my attention. Yes, it is tricky, isn’t it! But I wish I had a dollar for every woman I’ve met who says she would never wear perfume and then tells me about some body spray, or lotion, or soap, or hair product that she uses because it smells so good! In Europe at least, the adds that I’ve seen for Eau Dynamisante are presenting the product as being for the whole family, so more as an eau de cologne. Platinum, That *is* very interesting! Jessica – thanks for the review. I was wondering if this would get any attention. Now, I am going to be the big wet cloud that rains on everyone’s parade. I love eau Dynamisante, and I’ve had a bottle for many years. I was super excited for this eau des Jardins, and esp. with the heat we’ve had, this summer has become the summer of colognes for me. I’ve been wearing and wanting different colognes left and right. So, I bought eau des Jardins unsniffed…. and well, I was actually pretty disappointed. And I WANTED to like it, so I kept retesting it. I kept trying to persuade myself that it was good, but it just didn’t work on me. The opening for me was great super citrus – more like grapefruit, bergamot, and orange blossoms. I did get some sharp petit grain type note, which I like. It is a bit “sweet-juice” for my taste, but what ruined it for me was the during the middle notes and dry down- it just started to smell a bit synthetic for me. Just a bit of that lovely dryer sheet accord. It wasn’t awful, but I was actually pretty disappointed. It was probably just me as I had such high hopes for it. Maybe it was my nose at the time which was burned out on the heat, but it just didn’t work. Bummer. I love Clarins stuff. Oh, well! Nothing ever works for *everyone*, right? That doesn’t make you a rainy cloud. I should revisit it anyway in the future. Sometimes distance helps, you know? I don’t know that it would ever be FBW for me, but my opinion of it may improve. I was wearing Cristalle and Zeste de Rose a lot around the time I ended up trying EdJ and those two set the bar pretty high for citrus colognes. I do remember I thought EdJ was basically good for the price point though. Any way, I did not like it, and feel that Clarins dumbed down to capture the young floral/fruity market. Can’t see where the aromatherapeutical elements of this are! I used to like their Elysium perfume (long gone), and still wear Eau Dynamisante. But this strange concoction is going to have to find a new home …. My cover is blown… I enjoy some fruity-florals! Jillie, not at all! Sometimes I surprise *myself* by what I like and don’t like. We all need some variety :)! Jillie – I washed this off after it got into mid development after I’d tried it the second time. It just wasn’t going to happen. I wasn’t going to get a heachache, but I couldn’t get my nose away from it far enough. Well, too bad – there are plenty of other good eau’s out there to be had. If I was heading into fruity floral citrus eau type frags, I’d just wander on over to the Hermes Jardin en Mediterranee, or Apres la Mousson, etc…. I just wish some of my favourites had the throw and sillage of the new Clarins! For a citrussy, fresh blast I am enjoying Annick Goutal’s Eau Hadrien (edt), and this can remove headaches that other eaux give you! Ah, Eau d’Hadrien… a classic! I’ve wanted to love Clarins scents – they always sound so appealing – but for some reason they’ve all been “meh” on me. Not quite right. I’ll try this one – you’ve made it sound so delightful – but I’m not holding out much hope. Still..one never knows! Maggie, After all, it’s all a matter of taste! They’re definitely not complex in the way that a vintage Guerlain or Caron is, for example… but I certainly prefer them to most other “department store” fragrances. Sometimes I want something sort of fresh and not-too-complicated… but not boring. It’s a fine line! Jessica, not sure if it’s really new or my computer is just catching up, but I really love you new gravatar! Also glad to be reminded of the Clarins fragrances. Really love L’Ombre dans L’Eau for summer, too. Hi, Nozknoz! I only changed the gravatar about a week ago. Not *too* different, right? I’m very predictable! I’m glad this new release reminded me about Clarins’ fragrances and body products, too. Must look out for this in my local Boots. I have the Eau Ressourcante rich body lotion (very marine / spa / sauna-like) and a decant of Par Amour, which holds a strange appeal despite the rather synthetic woody rose combo. Perfumes The Guide speaks highly of Par Amour too, which surprised me. Anyway, this sounds very pleasant, and its positioning as a “Well being” product is jolly clever! Hi Flitter — I was intrigued by Par Amour, although it isn’t quite “me.” Eau des Jardins is much less “perfumey” than Par Amour, but still more of an actual fragrance than I expected. Worth a sniff in Boots, in any case! Owen, oh no! lol. The “Well Being” scents are all very age-neutral. The Sunshine one is pretty youthful, actually. Oh, I get it! You’re right… they’ve always had lots of anti-aging skincare, and the bottles and boxes are covered with fine text about cells and molecules and other scientific-sounding skin issues! Hi, APJ — They don’t have any matching products… too bad, right? Glad you enjoyed the fragrance when you tested it! Just wondering what you think of ‘Eau des Jardins’ as a fragrance for men? I tend to prefer more feminine fragrances and sampled this one at the local dept. store. I liked the scent and the idea that the oils, ingredients are actually good for the skin.